Each patio handle comes with a LIFETIME coating guarantee! 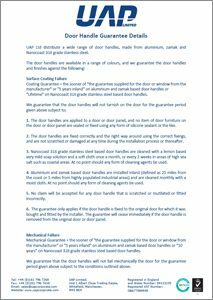 The UAP Nanocoast Patio Door Handle has been made with ease of fitting, smooth operation and high quality in mind and is aimed at the fabricator who wants to offer a high quality designed patio door handle. Contemporary in appearance, the Patio Door Handle has a 219mm backplate and offers plenty of space to grip the handle for a more comfortable opening operation. We have made fitting the patio door handle simple with our patented screw alignment feature. This allows you to easily line the holes in the handle up with the holes in the door, and the feature will hold the screws in place while you’re drilling. The handle also comes ready fitted to the backplate, but if you need to adjust the direction of the handle it can easily be removed and re fitted. 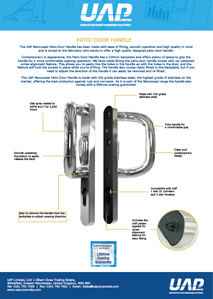 The UAP Nanocoast Patio Door Handle is made with 316 grade stainless steel; the highest grade of stainless on the market, offering the best protection against rust and corrosion. 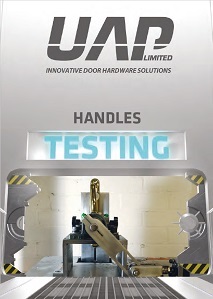 As it is part of the Nanocoast range the handle also comes with a lifetime coating guarantee!